People who found the suspected bolide rocks were described as knowledgeable collectors. So that sonic boom heard from Boomtown to Bakersfield and beyond did indeed have out-of-this world origin as ”a large meteoric event” according to NASA’s Meteoroid Environment Office. Even that may be an understatement. The event rattled windows, set off car alarms and sent a glaringly bright light through the sky followed by a loud boom around 8 a.m. Sunday. Scientists now estimate the blast measured in near 5 kilotons or roughly 1/3 the power of the atomic bomb dropped on Hiroshima, Japan during World War II. Bill Cooke of the Meteoroid Environment Office at NASA’s Marshall Space Flight Center in Huntsville, Ala., estimates the object was about the size of a minivan, weighed in at around 154,300 pounds. The Associated Press is reporting that possible remnants from the blast are now being found near the Sierra foothills just east of Sacramento. 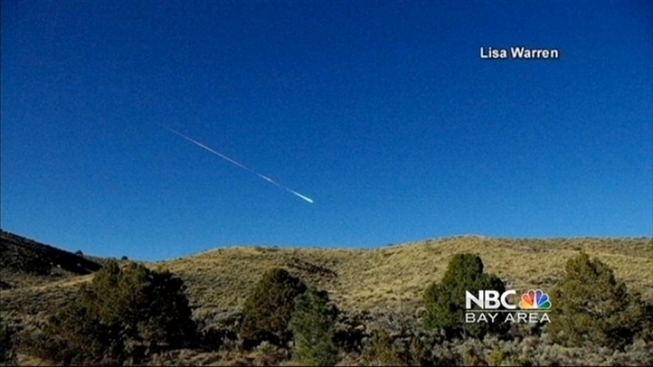 The report says tiny meteorites found in the Sierra foothills of Northern California were likely part of a giant fireball that exploded in daylight. The rocks each weighed about 10 grams, or the weight of two nickels, said John T. Wasson, a longtime professor and expert in meteorites at UCLA’s Institute of Geophysics and Planetary Physics. Wasson told AP that one meteorites was found near the town of Coloma, about 35 miles northeast of Sacramento and another was discovered to the west near Lotus between Auburn and Placerville. He said they were located by collectors who were knowledgeable but did not identify them. The event was recorded via the Nevada Seismological Laboratory as the sound wave (sonic boom) passed across the ground from seismological station to station in Nevada. Based on initial reports, University of Nevada Reno astronomers believed the likely cause was in fact an exploding meteor, also known as a bolide roughly the size of a washing machine entering the Earth’s atmosphere at a high rate of speed. Bolides are known for explosive ends to their brief journey through the atmosphere as intense heating and deceleration forces can cause the object to explode, with a field of smaller meteorites sometimes reaching the surface. Scientists now believe the object may have been possibly larger, therefore packing more potential energy proportionate to its speed and size. Based on many eyewitness reports on the American Meteor Society’s website, the event was possibly seen over several states, the object may have remained largely intact for awhile before finally exploding in a dazzling if not ear-numbing finish. But was the item’s origin related to the Lyrid Meteor shower that was occurring at the same time? Based on what is known of most meteor showers, it seems unlikely and more of a unique coincidence. Meteor showers caused by the Earth passing through the path of a comet, such as in the case of the Lyrid Meteor shower where the Earth is moving through Comet Thatcher’s debris field, often involve sand grain to pebble sized objects that enter the atmosphere at speeds sometimes exceeding 100,000 mph. These tiny objects burn up in a brief flash of light we see as meteors in the night sky and rarely are large enough to actually reach the ground. As comets are made out of a varying combination of ice and rock, they like “dirty snowballs” thought to be left over remnants of the earliest formation era of our solar system. As these object swing past the Sun, ice and rock is vaporized, ablated off the surface of the comet which the Earth later will sometime come into contact with as the planet revolves around the Sun. This is the case with all meteor showers such as the more well known Perseids, Leonids and Orionids. 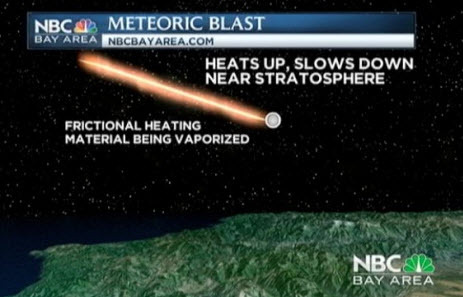 So what was the source then for Sunday’s Sierra meteoric blast? Cooke has a theory. And just how rare was Sunday’s event? Its close to a once in a year occurence and rarer still it happened near a populated area. An event of this size might happen once a year around the world, said Don Yeomans of NASA’s Near-Earth Object Program Office at the Jet Propulsion Laboratory in Pasadena, Calif. “But most of them occur over the ocean or an uninhabited area, so getting to see one is something special,” Yeomans added. Thousands of people from the Sierra to the sea would likely agree with that point of view. Sources: Jet Propulsion Laboratory, SpaceWeather.com, NASA Meteoroid Environment Office, Neveda Seismological Laboratory.